The Borobudur is a giant Buddhist temple complex in Central Java (Jawa Tengah), Indonesia. There is no written record of the construction and experts believe that it is most likely built between the 8th and 9th century during the Sailendra dynasty. The building sits on a mountain and has nine so-called stupas. The first 5 make up the piramidacal base of the structure, on top of that are 3 circular stupas and finally there is one big stupa on top of all the others. Around the 3 circular stupas are 72 open stupas with statues of Buddha inside. In the 10th of 11th century the temple was abandoned, and only rediscovered at the end of the 19th, after which the structure was cleared from the vegetation, and finally at the end of the 20th century it was restored with the help of the UNESCO. 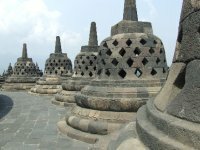 The Borobudur Heritage Site is managed by P.T. Taman Wisata Candi; more information can be found on their website. An hour's drive from Borobudur lies the Hindu Prambanan temple complex, which is also on the UNESCO World Heritage list and managed by the same company. Borobudur consists of six square platforms topped by three circular platforms, and is decorated with no less than 2,672 relief panels and 504 Buddha statues of various types. The main dome, located at the centre of the top platform, is surrounded by 72 Buddha statues seated inside perforated stupas. The square base is 118 metres long on each side, and the highest point 35 metres above ground level. The Samudraraksa Museum displays the actual size replica of Borobudur Ship. It also displays the maritime technology and trade network of 8th century Asia and Africa, especially the maritime trade of Indian Ocean. In 1982 a British naval history scholar called Philip Beale was visiting Borobudur when he noticed 10 panels depicting ocean-going ships. He surmised that these ships may have been a part of a famous shipping route - the Cinnamon Route - that linked Indonesia to Africa many centuries earlier. This led Beale to build a model ship based on those depictions, and that is now housed in its own dedicated space within the museum. The Karmawibhanga Museum displays archaeological findings around Borobudur, the restoration process, as well as the photographs of Karmawibhanga relief on the hidden foot of Borobudur. It does a sometimes haphazard job of presenting the restoration process. Perhaps the most interesting exhibitions about this are those of the law of karma reliefs, with explanatory comments, and the photo gallery of late 19th-century shots of the complex before it was restored. The museum is open daily 06:00-18:00 and entry is included with the main Borobudur ticket. The park opens daily from 06:00am until 05:00pm. Every year more than 3 million people visit Borobudur. Borobudur is not only a favorite of foreign tourists, but also domestic tourists, mainly students of all ages, usually in May and June. If you are planning a visit, try not to visit during school holiday season, it is worth investigating those dates. Another date in the Indonesian calendar to consider is that of Idul Fitri and up to a week after. USD 25 / Rp 350,000 for adult non-Indonesians. US $11/Rp 104,000 for non-Indonesian registered students (proof, e.g. ISIC, is required). Rp 15,000 on weekdays and Rp 17,500 at weekends for Indonesian adults or foreign holders of an Indonesian work permit or KITAS. Hiring a guide who can explain the reliefs in some detail costs Rp 75,000-100,000 per hour. Some guides may insist on a minimum time of two hours. You should ask for a guide in the evening before going to tour in the morning. It is also perfectly possible to roll up and find a guide available, it all depends on how busy the site is. Guides speaking European languages other than English may be available. The nearest larger airports are Yogyakarta's Adisucipto International Airport (JOG IATA) and Solo's Adisumarmo International Airport (SOC IATA). Both are well connected domestically, and also offer some international connections to Singapore and Kuala Lumpur. AirAsia for example flies from Singapore to Yogyakarta daily. It is possible, if one rushes oneself a bit, to visit Borobudur on a day trip from Bali or Jakarta. One can also fly direct to Semarang's Achmad Yani International Airport (SRG IATA) with SilkAir from Singapore and with Air Asia from Singapore and Kuala Lumpur, and make your way to Borobudur from there (2–3 hours by road). The public buses to Borobudur from Yogyakarta are aimed mostly at Indonesian visitors, and only a few tourists venture aboard. If you are adventurous though, the Trans-Jogya service runs from central Yogyakarta to Jombor bus terminal in northern Yogyakarta, bus 2B/2A (Rp 3,000), where you can change to another bus to get to Borobudur. It takes about 60-90 minutes, and should cost around Rp 10,000-20,000 one way. If you are a tourist, the bus conductor may try to charge you more than the local rate, so if you are on a very tight budget you can negotiate a little for a better price. To get from or to the Hindu temples at Prambanan, take a Yogyakarta bus and get down at Jombor Terminal (90 minutes, Rp 15,000 for foreigners, Rp 7,000 for Indonesians). From Jombor take TransJogya route 2B to Prambanan (45-60 minutes, Rp 3,000). It will require 3 bus changes: 2B from Jombor to Terminal Condong, 3B from Terminal Condong to Maguwo (Jl. Solo) and 1A/B from Maguwo to Prambanan. Travel agents in Yogyakarta sell door-to-door minibus tour packages for around Rp 75,000. This is a good deal and a straightforward way to reach the monument, although some operators may stop off at batik and silver factories along the route. Borobudur is about 40 minutes north of Yogyakarta by car. Most of the route is on a well-maintained (for Indonesia) four-lane (in many places) highway, and there are frequent bus services (see above). A taxi from central Yogyakarta to Borobudur costs around Rp 200,000, and from Yogyakarta airport about Rp 225,000. The only practical means of getting around Borobudur is on foot. A toy train of limited practical use shuttles around the temple, and between the museum and entrance gate for Rp 5,000. To get out go to the main entrance. Be wary of the Exit signs as they lead to a maze of souvenir stalls. The bus station area is home to a multitude of hawker stalls selling standard Indonesian street food and all manner of drinks. Be aware that most close by 5:00pm. Otherwise the only dining options are in hotels. Manohara Restaurant, inside the grounds of the hotel of the same name, serves up standard Indonesian fare while offering beautiful views of Borobudur. Mains from about Rp 25,000. Amanjiwo has truly spectacular food at even more spectacular prices. The vast majority of visitors stay in Yogyakarta and a few in Magelang. It is though well worth spending the night at Borobudur as this will give you a chance the following morning to get to the temples before the crowds arrive. Indeed, if you really want to explore and understand this magnificent monument, over-nighting in the immediate area is vital. This is version 14. Last edited at 9:39 on Dec 27, 17 by Utrecht. 8 articles link to this page.